Trees of London Scroll down for more information. 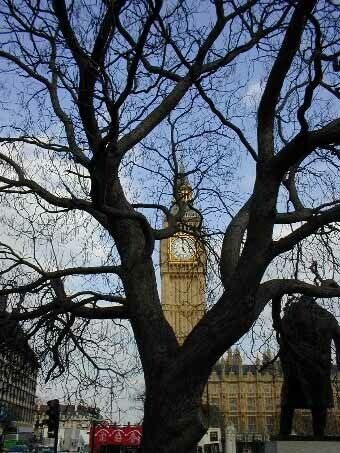 Where to find typical examples of tree types throughout central London. hazel tree, birch, laburnum, Judas tree, cotoneaster, Indian bean tree, Cornelian cherry tree, oak tree, silver maple, and sugar maple. black poplar, acacia, honey locust, ginkgo, London plane, Norway maple, sycamore, rowan, and bird cherry . walnut tree, lime tree, strawberry tree, giant fir, ironwood, orange, sweet gum, English elm, lawson's cypress, Italian alder, and beech. including, Tavistock Square and St Mary Le Strand. weeping willow, box, dwarf box, silver wattle, plum tree, hawthorn, field maple, magnolia, Bosnian pine, bay laurel, Turkish hazel, pear tree, Lombardy poplar, hornbeam, elder, swamp cypress, sessile oak, crack willow, sweet chestnut, wingnut, vine, and white gum. Norway spruce. it rains down over London. Listed below are a few sites which are worth a visit, but don't forget to return. www.hainaultforest.co.uk: excellent photos of trees from a wood near Epping Forest. www.the-tree.org.uk: information, stories and myths relating to trees. www.cristianasetaro.com: artistic photos by Cristiana Setaro; winner of Lauderdale House competition 2008.
www.londontourist.org: a tourist guide to London which is fun to read even if your not visiting London.